Experience a tradition of excellence at *Shenandoah Villas at Killy Court*. With Virginia's only quad chairlift and a vertical drop from 795 to 1,110 feet, the resort offers a thrilling challenge for downhill skiers and snowboarders. Also on site, enjoy two extensive sports complexes with an indoor pool, gymnasium, racquetball courts, exercise equipment, steam room, sauna, massage services, and children's programs. Relax at this peaceful mountain resort! Week 51, Christmas every year (Sunday check-in)! Buyer may receive a title fee credit, inquire for details! 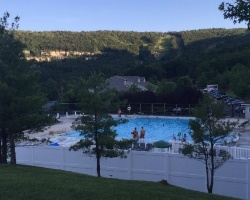 Family friendly resort with a vast array of amenities! Week 18! Buyer may receive a title fee credit, inquire for details! Beautiful resort set in the mountains! Week 15 every year! Buyer may receive a title fee credit, inquire for details! Great resort set in the mountains! Enjoy the onsite spa, golf course and more! Inquire for details!